Dan Abbott with whis winning catch at the Cedar Pool. There is just no stopping Martin Harwood on the Haddon Lodge Fishery right now. If my records are correct he has won six matches in a row which in local club matches is almost unheard of. Last weekend he was top rod again as his tried and trusted big banded pellet approach worked wonders putting 42lb 5oz to the scales. Second was Lucio Mellio with 34lb 13oz, followed by Tony Moulds on 25lb 3oz. Fenland Rods fished Buttonhole Fishery which saw one half of the lake fish really well while others had to settle for a few bites. Leading the way in this one was Dave Garner who drew peg 17. After a slow start to the day the carp eventually arrived in numbers and he bagged a very impressive 173lb 5oz. On the very next peg was Bill Foster who fished a small bomb to the point of the island to weigh in 135lb for second place. Moving up the table each week is Wendy Bedford, who came in a comfortable third and will be looking for a match win before very long. Wendy caught 75lb 7oz. JVAC were in action in the Angling Times/Bait Tech Supercup event taking on a strong Rutlanders side in round two on the Damson Pool at Decoy and it proved to be a very close and exciting contest. At the weigh in the teams were tied on section points, but JVAC went through to the next round with a superior weight advantage putting 478lb to the scales with Rutlanders some way behind on 357lb. The visitors did have the pleasure of seeing Tom Neal taking the individual honours.He fished paste over pellet catching carp to double figures for 110lb 12oz. Andy Gausden was not too far behind with 104lb 4oz followed by JVAC team mate Lee Kendal on 86lb 10oz. The following day JVAC were back fishing the club’s busy fixture list on the Cedar Pool at Decoy which saw Dan Abbott in great form. He fished pellet shallow from peg 13 before switching to the margins late on with red maggot to finish top on 129lb 9oz. The consistent Roy Whincup was not too far off the pace. He put 114lb 14oz to the scales catching short on cat meat followed by Ian Frith on 109lb 7oz. Float Fish Farm Fishery continues to improve week after week for both the pleasure and match anglers. 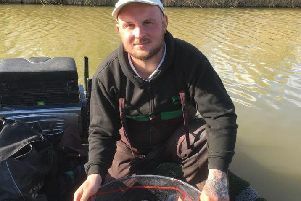 In the midweek open match Danny Carlton took the honours from peg 26 putting 154lb 10oz, catching on the feeder and pole. Runner up was Barry Young with 148lb 12oz, followed by Mark Cree with 129lb 5oz. The regular Saturday Summer Series was on Two Islands which saw Barry Young improve on his midweek result by topping the field this time. Drawn on peg 31 Barry caught carp to double figures to finish with 131lb 2oz. A close second was Mark Cree with 130lb 14oz, then came Andy Lawrence with 128lb 11oz. Webbs AC were also at Float Fish Farm. Their venue was the Kingfisher Pool which is well known as a small fish water, but top rod Ted Rowe found the carp and romped home with 67lb 7oz taken on the long pole and pellet waggler. Second was John Allan with 29lb 2oz, followed by Dave Marzell with 17lb 14oz.